about pain, pressure, or temperature from the body to the brain. Many small bers are bundled inside each nerve to carry the messages. 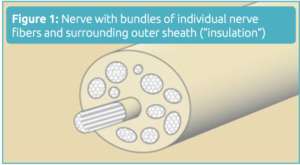 There is an outer layer that insulates and protects the nerves (Figure 1). Sometimes, nerves can be damaged. Nerves can be damaged by too much pressure, by stretch- ing, or by a cut. Carpal tunnel syndrome is an example of a problem that arises from too much pressure on the median nerve in the hand. Carpal tunnel syndrome can injure the median nerve slowly over time or, in the case of trauma to the area, it can occur much more quickly. A cut to the nerve can cause it to no longer transmit sig- nals, because the signal cannot jump through a gap in the nerve. Stretch injuries to the nerve can range from mild, temporary injury to a more severe, permanent injury. The extent of the injury depends on the amount of stretch. • Numbness: Some nerves only transmit sensation, so a nerve injury to these nerves would cause some amount of numbness. • Weakness: In addition to sensory nerves, some nerves give you the ability to move, and other nerves do both of these things. Injury to nerves that carry motor signals causes some amount of weakness. • Pain: This is frequently a symptom after nerve injury. The pain present after a nerve injury can be anywhere along the course of the nerve, but it is typically at the injury site. Symptoms of nerve injury may be intermittent, if the injury repeats itself; or they may be constant, if the injury is severe enough. There are many other signs of nerve injury: muscles that get smaller, color change in the skin, and changes to the amount of sweat in certain areas. An example of a nerve injury that can recur is carpal tun- nel syndrome. Carpal tunnel syndrome occurs when the median nerve has too much pressure on it as it crosses the wrist. The symptoms of numbness in the hand, pain in the hand, pain in the wrist, pain in the forearm, or weakness (particularly in the thumb) can be present. The symp- toms of carpal tunnel syndrome can be intermittent or, if severe enough, can occur all of the time. • Mild injuries to the nerve: The nerve can repair itself, either within minutes or after a number of weeks. During this time, messages between the brain and body can be altered. Supportive treat- ment often helps, but in some cases surgery is needed. • Broken nerve bers or more severe injuries: The nerves can grow back to their muscle or skin areas, but this process can take several months, and the messages between the brain and body will stop un- til the nerves grow. Treatment may be supportive care, but surgery may be needed depending on the type of injury. • Cut nerve: When both the nerve outer wrap and inner bers of the nerve are cut, surgery is typically needed to allow the nerve to heal correctly. In surgery, the nerve ends may be sewn back together. The inner nerve bers will need to grow back to their muscle or skin areas to regain function. The nerve bers grow slowly and, in ideal conditions, may grow about one inch every month after a nerve is sewn back together in surgery. It can take many months for the nerve to finish growing after an injury depending on many factors including the length that the nerve that needs to grow. It can also take this long for muscles to work well again. There might be numbness, pain or a “pins and needles” feeling during the healing period. Physical therapy is sometimes needed after a nerve injury. Results during recovery after nerve injury can depend on your age and health, the type of nerve injury, and the injured body part. The term “wrist” is used to describe the joint where the hand is connected to the forearm. The actual anatomy of the wrist is not as simple. 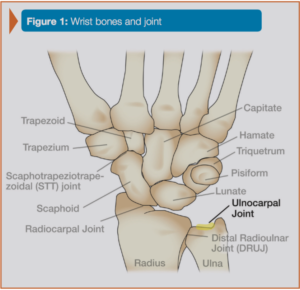 There are eight smaller bones that connect the five main hand bones (metacarpals) to the two forearm bones (radius and ulna) (Figure 1). Pain on the pinkie (ulnar) side of the wrist is very common. It can result from injury to bones, cartilage, ligaments or tendons. 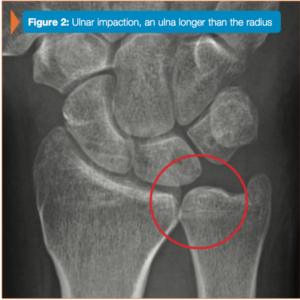 The treatment of ulnar-sided wrist pain depends on the diagnosis. It can include some combination of activity modification, splinting or casting, hand therapy, anti-inflammatory medicine and/or steroid injections. If non-operative treatment does not relieve symptoms, surgery might be considered.